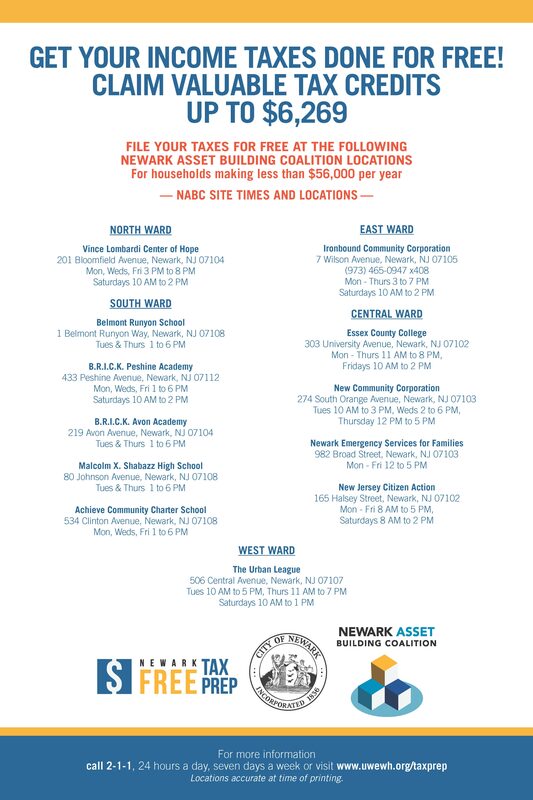 Mayor Ras J. Baraka, United Way of Essex and West Hudson President & CEO Catherine Wilson, along with members of the Newark Asset Building Coalition (NABC) kick off this year’s tax season by launching a free income tax assistance preparation program for Newark residents today‍. The VITA program provides free certified tax preparation assistance and legal aid to low- and moderate- income New Jersey families who earn less than $54,000 per year. During the 2018 tax season, VITA tax counselors filed more than 8,400 returns, an increase of about 700 from the prior year. The preparers found $13 million in total refunds, compared to $10 million from the previous year, including close to $6 million in Earned Income Tax Credits. Moreover, Newark Free-Tax-Prep sites saved clients another $1.7 million in tax-preparation fees, adding further value to the overall economic impact that VITA has on hard-working residents. VITA will also offer Financial Aid U for low-income students, which helps them fill out the FAFSA (Free Application for Federal Student Aid) form, which enables them to get access to financial aid to pay for college. Additionally, the NABC is also launching its Bank On initiative that helps residents in the Greater Newark area to gain access safe and affordable banking products and services, Bank On Newark partners across sectors to work to connect residents to banking products that are certified as meeting the Bank On National Account Standards. Current partners include: Bank of America, Citi, Chase, Wells Fargo, Capital One Bank and MoCafi.